The wrap is in Canadian stores already and is $168. It looks like lululemon gives their employees a four day weekend over Easter so Katelin put WWL up early this afternoon. There is nothing that we haven't already seen released in other countries. 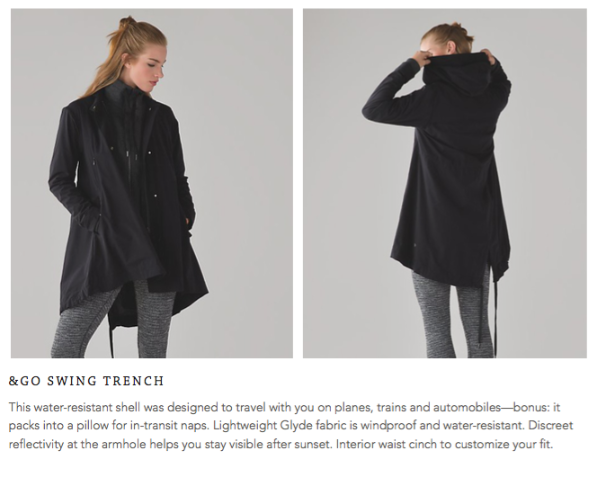 I know the &Go Swing Trench created a bit of stir when the spring sneak peek video came out and if you need more details about it, check out the Hong Kong website. It seems weird that Deep Zinfandel is out now. I checked the Spring and Summer Pantone palettes and egg plant purple is not on it. Maybe a random roll of fabric was found. It looks like my wallet is safe again this week baring some surprised. The wrap looks comfy but since it's &go I bet it's around $200...for spring in LA it is too much. It was 85 today, I don't need a fleece looking wrap. I like the Endeavour Tank. HKD has it at 550 so I'm guessing it'll be 58. Hopefully that is the case. Off topic, what did you think of the Essentials bag that you recently ordered, LuluAddict? The reviews are glowing and I know a few who really aren't thrilled with their Essentials bag. That bag too is on my wish-list....I love such bags to carry on vacations or running around in town, the city , or on vacations. TIA! Agree that everything looks like it should have been out in November. Love Deep Zin, but I don't really have a use for High Times. One of my main sports is figure skating and high times don't work well for that. 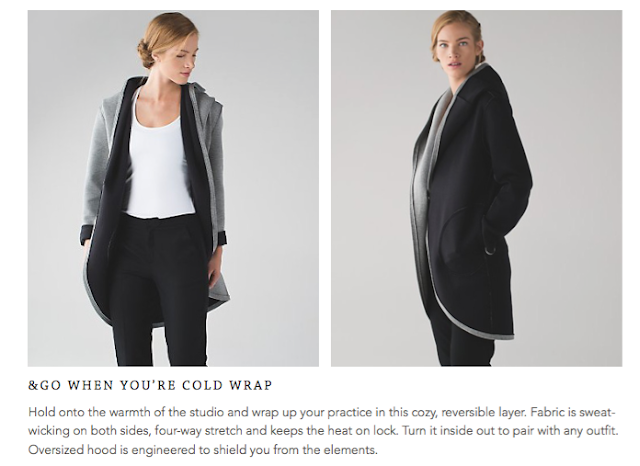 I like the shape of the wrap, but I think it's going to be really cheap, cotton sweatshirt type material, so I'll pass. The wrap is 178 euro on the European website so probably will be $178 or lower in north America is my guess. It's also in the 80s where I live so I don't need it either. It looks cool though. Nothing of interest here. Today is a public holiday in Canada so I guess that's why what we love is up early. It does seem strange that LLL would release deep zinfandel at this time of year. As much as I love deep zinfandel I would have preferred to see it come out for 2016 Fall/Winter product. I would have liked to see a lighter version right now or even Night Fall which is out in the mens line right now and I would love some summer clothing in that colour because it is a fave of mine. There is nothing in the &Go line shown here that's interests me at all. I would have checked out the trench coat had they put a decent collar on it. I'm actually tired of so many &go pieces! There's only been one item that I have found to be decent and even that was purchased at a significant discount on WMTM (&go Flare pants) I am still puzzled at the high prices of the line. Most of those items end up on WMTM... not a coincidence. On a side note, I'm waiting for lulu to return to the bright, fun colors and prints that they used to release! We are obviously craving them (look how quickly the Rio Nights speed shorts sold out). Nothing for me this week either unless a nice color swiftly or CRB uploads to go with the Rio shorts. I'm tired of the &go stuff too. Where is the technical spring running gear? I feel like all we're getting is athleisure. I get it. Lots of women love athleisure and want to logo up 24/7 and it's a booming market but I wear this stuff to actually work out in. Literally 00000 of this is even for working out? So maybe, LLL, you balance out and give us the athleisure AND the actual technical pieces? Please? Pretty please???? @ anon 9:48 am - how interesting. I'd try calling the stores. I didn't get the sense it was that popular. @4vrfit - very little of the &go stuff appeals to me. They seen to trot it out at the end of the month, when they're out of technical stuff to release. Just saw a photo -the wrap is $168. I think the wrap looks super cozy...have to see in person. Oddly enough, I have been wishing for High Times in Deep Zinfandel. I'd love a CRB too. Supposedly the wrap is already in stores. I would really appreciate it if anyone who tries it could give some fit advice. I have not bought a jacket that is sized in S/M/L versus numbers sizing. 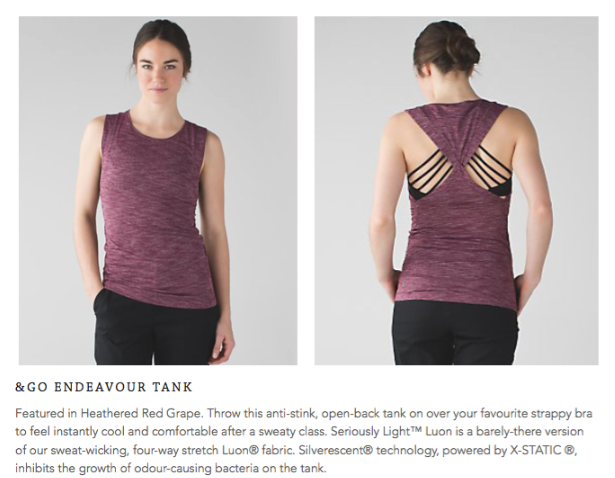 For the first time ever, &Go items appeal to me in the &Go Endeavour tank and the When You're Cold wrap. However, will not pay full price for either and do not care if I acquire them. The wrap looks OK and not dumpy for a wrap, for once. Deep Zinfandel is a lovely colour but agreed, seems odd that it is coming out now - even if they are not following Pantone colours, it's more of an Autumn colour. I went to my store and tried on the &go When You're Cold Wrap but I didn't like it enough to buy it! It looks great open but I didn't like it closed. It was also very stiff and didn't feel cozy, which was a turn off. Also, the hood looks totally awful when you put it on. For $168+tax I have to love it and I didn't so it stayed at the store. I wear an 8 in CRBs and 10 in jackets. The Medium fit perfectly.